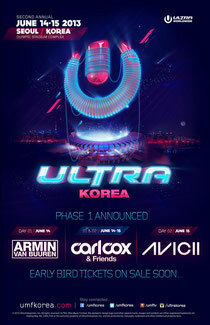 ULTRA Worldwide recently announced the headline acts for ULTRA Korea as the festival returns for edition #2 at the Olympic Stadium Complex in Seoul on June 14 – 15, 2013. The world’s #1 DJ Armin van Buuren and Avicii will take over the main stage with their shows on Friday and Saturday respectively. Carl Cox will be curating a diverse techno soundscape in his celebrated Carl Cox & Friends Arena over both days, which has become an ULTRA institution over the years; consistently delivering some of the best in underground house and techno from all over the globe. Following the success of the first ever ULTRA Korea last year (which saw 60,000 revelers attend the two-day event), coupled with the ‘Road To ULTRA Korea’ event which marked the halfway point to 2013’s festival with the likes of Diplo, Major Lazer, Hardwell, R3hab and Dillon Francis; the stage has now been well and truly set for ULTRA Korea 2013. The event is poised to solidify its position as the ‘must attend’ dance music event in Asia, with a whole host of new surprises in store for its second outing. For now, the remainder of the talent playing at this year’s event is being kept tightly under wraps. Tickets go on sale on Monday 21st January.